Barry Tuckwell became a horn player almost by accident. When he was a 13-year-old music student, he and his sister were sitting in a cafe in Sydney, Australia with conductor Sir Charles Mackerras and a French horn player from the local symphony. They were speculating on what Tuckwell's future in music might be. The horn player suggested, "Why not try the horn?" So Tuckwell did. Two years later, Barry Tuckwell was playing in the Sydney Symphony Orchestra. After coming to England in 1950, Tuckwell studied briefly with horn virtuoso Dennis Brain. Five years later, he joined the London Symphony Orchestra as principal horn, which is also where he made his first major recordings. Barry Tuckwell was considered the first great successor to Dennis Brain, and a lot of young horn players grew up looking to these two performers for inspiration. I asked a few colleagues and friends who are also former horn players to weigh in on Tuckwell. Some thought his style too delicate; however, they added that his lighter touch also made him a fine Mozart interpreter. At his best, in their opinion, Barry Tuckwell has a rare combination of big sound and refined technique. As I listened to this new retrospective, which marks Tuckwell's 75th birthday, I heard all of these things and more. Over and over again I latched on to Tuckwell's "singing" sound, which brings life to the music. Tuckwell's favorite singer, Frank Sinatra, may have provided some inspiration because these performances are layered with smooth lines and packed with feeling. Franz Danzi's Horn Sonata in E-flat Major, available for the first time on this recording, gives Tuckwell a chance to croon a little. The opening is very sentimental, and it sets the stage for what almost sounds like a mini-opera. Tuckwell is quite comfortable in the lead role, as pianist Vladimir Ashkenazy playfully chides him throughout the performance. There are times when Tuckwell's tone can be harsh but he's always in control; the French horn can be a treacherous instrument to play. To hear the more powerful and no-holds-barred side of Barry Tuckwell, jump to Track 6 on CD 2 for Richard Strauss's Horn Concerto No. 1. This performance comes from an early 1960s recording with Istvan Kertesz and the London Symphony Orchestra. After the orchestra hits its opening chord, Tuckwell takes a deep breath for his grand entrance. He's not afraid to belt out a line when the score calls for it. He also knows how to play with great expression with well articulated louds and softs, all the while reveling in a rich, warm tone. Over a period of 30 years, Barry Tuckwell has made numerous recordings for Decca and its sister label Argo--more than any other French horn soloist. His repertoire ranges from Baroque to contemporary music, and this new two-CD set is a great retrospective of his career. It also includes three previously unreleased works. 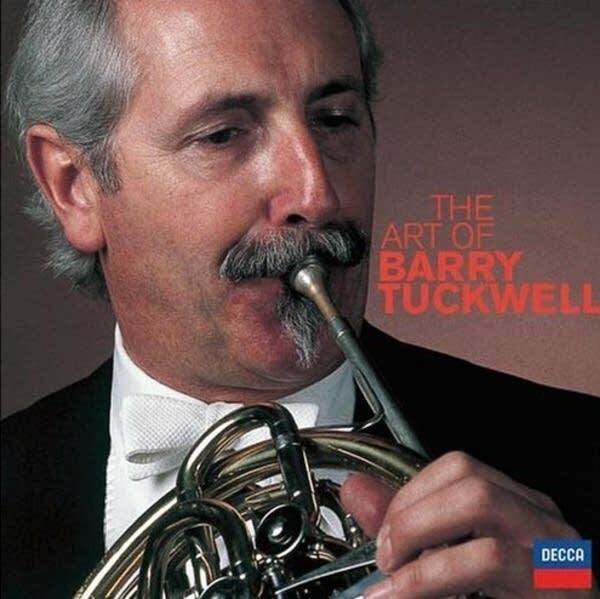 "The Art of Barry Tuckwell" is a great way to introduce yourself to the French horn and one of its best practitioners of the past half-century, Barry Tuckwell.